The Sugar Solution is published by the editors of Prevention magazine who claim that their program can bring about blood sugar balance within one month. It is targeted toward the large number of people who are not diabetic but are nonetheless affected by poor blood sugar balance that may not only be affecting their ability to lose weight, but also may be causing symptoms such as fatigue, depression, and poor concentration. If blood sugar is not brought under control it may progress to a number of serious problems including heart disease, cancer, and diabetes. 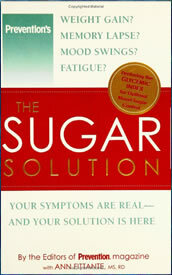 The Sugar Solution focuses on three major areas; healthy eating, exercise and stress relief to give readers the knowledge they need to prevent the onset of diabetes as well as how to create balance if already diagnosed with a blood sugar related syndrome such as insulin resistance or polycystic ovarian syndrome (PCOS). The diet is centered on selecting foods with a low glycemic index. Three balanced meals as well as three small snacks are recommended daily so as to provide the body with a steady supply of nutritious fuel throughout the day. Dieters are provided with practical strategies for selecting healthy foods when eating out, how to indulge in sweets without disrupting blood sugar balance and are given advice on nutritional supplements to enhance the effects of the program. Low glycemic index carbohydrates such as whole wheat breads, pasta and legumes. High fiber foods are emphasized because fiber is linked to a reduced risk of diabetes and heart disease. Low glycemic index fruits such as apples, pears, blueberries, tangerine. Vegetables such as carrot, spinach, broccoli and baked potato. Protein sources can include steak, turkey, chicken and seafood. Foods high in mono-unsaturated fats are recommended such as olive oil and cashew butter. These fats are associated with a reduced risk of diabetes and cardiovascular disease. The importance of exercise in a weight reduction program is outlined and The Sugar Solution includes a 10 minute strength training regime. The online program also provides animated fitness demonstrations. Exercise suggestions are made that will suit a busy lifestyle and won’t require expensive gym memberships or a large time commitment. The Sugar Solution book costs $24.95. Covers many aspects of health including exercise and stress management. Provides education about how to make healthiest food choices. Can easily be used as healthy lifestyle program after target weight is achieved. Online support shown to relate to a greater degree success with weight loss programs. Prevents the risk of diabetes and heart disease. Menu plans rely heavily on wheat containing foods such as bread, pasta, crackers and cereals and will not be suitable for those with a gluten allergy or intolerance. Sugar in moderation has unproven health implications. If you have already been diagnosed a blood sugar imbalance or have a family history of diabetes or heart disease, the Sugar Solution provides a balanced program that will not only help you lose weight but will also help you create a lifestyle that will support health over the long term. I just finished 3 grueling days of the “Sacred Heart Medical Diet.” I simply cannot go this long with no protein, so I’m looking for a solid alternative. My mom and sister have diabetes and my fasting blood sugar is rising, so… why weight? (bad pun) I think $25 for the book is a little steep but is a competitive price. I might vary it a little giving myself less grains and carbohydrates. I would continue this vegetable soup from Sacred Heart Medical Diet as an adjunct because it is delicious and really staves off (most) hunger pangs. Wish me luck in this diet quest! Thanks, Saunders PS Any advice welcome. i just inserted links to the book. There are lots of studies out there concerning blood glucose levels and high glycemic index foods. Google it. has this diet been put to any scientific tests??? and what book are you talking about?? ?